I gave my son The Library of America's recently released Raymond Carver: Collected Stories for his eighteenth birthday a few weeks ago. He had discovered Carver's stories this past summer while attending a writing workshop at Lewis & Clark College in Portland, Oregon, and Carver immediately jumped the list to become his favorite writer. "A Small, Good Thing" is also my son's favorite Raymond Carver story. As many readers know, it's a longer version of a story called "The Bath" that appeared in What We Talk About When We Talk About Love. 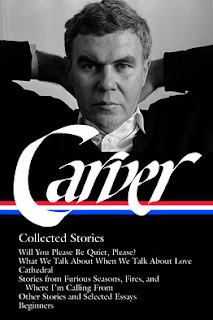 Much has been made of Gordon Lish's strong hand in editing Carver's work on that collection. And questions have arisen about the importance of the edited versions in establishing Carver's reputation. In December 2007, The New Yorker ran the story "Beginners," which was Carver's longer version of the title story, along with an account of his conflicting feelings about Lish's changes and, online, a recreation of Lish's edits. The Library of America edition includes a section, called Beginnners, that presents the original manuscript of What We Talk About When We Talk About Love that Carver submitted to Lish. I've always liked "A Small, Good Thing" better than "The Bath," but I have to give Lish his due for his role in Raymond Carver's development as a writer and some credit for the critical reception What We Talk About When We Talk About Love received. Editors matter, and I'm sure other editors have (perhaps more quietly) played a significant role in a writer's reputation. Collaboration is an important part of the creative process and shouldn't necessarily detract from an artist's success. Here's an analogy I would make: Would the Beatles be the Beatles without producer George Martin? Yes, but Martin undoubtedly made a huge contribution that is impossible to separate from the band's lasting reputation. Would Raymond Carver be Raymond Carver without Gordon Lish? I have little doubt. With or without Lish's contribution, Carver is--and still would have been--a great short story writer. In any event, readers can now compare the different versions and see what they think. * I'm not sure of the legalities, but maybe if I can sort that out, I'll post a copy of the letter some time. 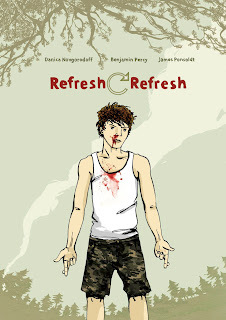 Benjamin Percy's short story collection Refresh, Refresh was one of the better books we read for The Story Prize in 2007. At the time, the title story already had quite a pedigree: It was published in The Paris Review in 2005, which led to Percy winning the Plimpton Prize, and Ann Patchett chose "Refresh, Refresh" for The Best American Short Stories 2006. Now, a film is in the works, and Percy and the filmmaker, James Ponsoldt, have collaborated with graphic artist Danica Novgorodoff on a graphic version that will be out this week. What's next? A Broadway show? An ap? An opera? I wouldn't rule anything out. The story, incidentally, concerns a young man, who lives in a town in Central Oregon and whose father is fighting in Iraq. The title refers to the narrator, who, in his eagerness to get e-mail from his father, sits at the computer and repeatedly hits the refresh button. He and his friends, whose fathers are also off in Iraq, become increasingly reckless as they prepare themselves for a similar fate. This kind of collaboration between graphic artists and short story writers has a lot of potential, and I can think of a many great stories that would work well in this form. For instance, I'd buy a graphic adaptation of Flannery O'Connor's "A Good Man Is Hard to Find" or John Cheever's "The Swimmer" or Tobias Wolff's "Bullet in the Brain." (Who knows, they may already exist.) And in the years ahead I think more literary works will get the graphic treatment. A version of James Joyce's Ulysses is already underway. And then, there's R. Crumb's treatment of The Book of Genesis. Short stories will, of course, remain a vital written form. But a good story can and sometimes would do well to cross over into other mediums. Anything that gets kids--and adults--reading, right? Two Short Story Writers Win MacArthur Foundation Fellowships. Among this years "genius grant" recipients are short story writer Deborah Eisenberg (a pure play) and the first ever winner of The Story Prize, Edwidge Danticat, whose second short story collection, The Dew Breaker, is often classified as a novel. Four of the Six Finalists for the Best of the National Book Awards Fiction Are Short Story Collections. In 60 years, and out of 77 books, only 11 have been short story collections. But a panel of 140 writers chose four of those books among the six finalists. Those collections are: The Stories of John Cheever, The Collected Stories of William Faulkner, The Complete Stories of Flannery O'Connor, and The Collected Stories of Eudora Welty. Short story collections are, without a doubt, among the most enduring works of American literature. The Latest Oprah's Book Club Selection Is a Short Story Collection. On September 18, Oprah Winfrey announced that Say You're One of Them by Uwem Akpan is the next book club selection--the first time she's chosen a short story collection. Soon There Will Be Three Short Story Collections on The New York Times Best-Seller List. When Akpan's book hits The New York Times Best-Seller List for trade paperbacks, it's very likely that it will join two other short story collections: Olive Kitteridge by Elizabeth Strout and Unaccustomed Earth by Jhumpa Lahiri. Who says short story collections don't sell? The Inaugural $50,000 St. Francis College Literary Prize Goes to a Short Story Collection. On September 12, as part of the Brooklyn Book Festival, Aleksander Hemon's short story collection Love and Obstacles was announced as the winner of this new book award for mid-career authors. In addition, the Frank O'Connor International Short Story Award just announced it's surprising winner, Simon Van Booy's Love Begins in Winter. More on much of this later. For now, I rest my case. Oprah Winfrey finally did it. For the first time ever, she picked a short story collection, Uwem Akpan's Say You're One of Them, for Oprah's Book Club. Thank you, Oprah, I hope this won't be the last. Followers of this blog, who number in the low dozens, may remember that I've been lobbying for her to do this for more than a year, and obviously my efforts have been effective. In fact, now the top secret behind-the-scenes negotiations can be revealed. Somewhere in New Jersey. The official Story Prize phone (i.e., my cell phone) vibrates on a hot August night. OW: Hello, Larry Dark. It's Oprah. LD: Just kidding, Oprah Winfrey. The most influential person in America. A thousand apologies, she who sells more books than anyone. OW: Ha, ha, ha, ha, ha. I understand you think I should pick a short story collection for my book club. OW: I think I'm ready. What were you thinking of? LD: How about In the Gloaming? OW: Isn't that a Christopher Reeve movie? What else? LD: Well, Ron Hogan thought you were going to choose Edward P. Jones's All Aunt Hagar's Children a few months ago. That's a good one. OW: You know Ron Hogan? LD: Did I mention The Dew Breaker? The Hill Road? The Stories of Mary Gordon? Like You'd Understand, Anyway? Our Story Begins? LD: Let me think about what your readers might like. OW: Something powerful and moving like In the Gloaming. LD: Hmmm. Well, there's another book I read last year that might be perfect. LD: Say You're One of Them by Uwem Akpan, a Nigerian priest with an MFA from Michigan. It's well written, describes terrible events in the lives of children, and, to quote myself: "Any of the six stories in this collection set in Africa is enough to break a reader's heart." OW: Perfect. Be sure not to tell anyone, especially not Ingram. They're sure to blow it. LD: I promise. And, by the way, don't worry about what Rob Spillman thinks. OW: I won't worry about anything, Larry Dark. Thanks for all your critical wisdom. LD: Thank you, Oprah Winfrey--for being you. That's pretty much how it happened--in my dreams. In any event, I'm thrilled that Oprah has chosen a short story collection. I've been reading some great ones so far this year. The short story continues to gain momentum, and this is a huge boost. They sure know how to fund a literary award across the pond. On Sept. 13, the London's Sunday Times announced a £25,000 prize for just a single short story of up to 7,000 words from an author previously published in the U.K. or Ireland. (I'm not sure whether you have to be a citizen or resident of either place.) The deadline is November 30. 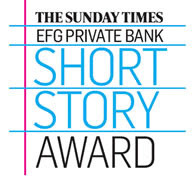 The name -- The Sunday Times EFG Private Bank Short Story Award -- is long enough to be a short story itself, but the prize comes to more than $40,000 at current exchange rates (at the least, close to $6 a word), more than any U.S. prize specifically for short fiction. The closest U.S. contender is the Rea Award, at $30,000, and that's for an author, not an individual work. The prize for the Ireland-based Frank O'Connor International Short Story Award is £35,000 (we'll find out the winner in a few days). For the most part, U.S. literary prize amounts are markedly lower than those in the U.K. and Ireland. Enlisting corporate sponsorship has allowed book awards like Man Booker to hand out some pretty nice checks (£50,000). It's hard to imagine a U.S. newspaper teaming up with a U.S. bank to create a short story prize (especially with both industries tottering). The Los Angeles Times Wells Fargo Short Story Prize? The Financial Times and Goldman Sachs, however, do team up for a business book award. So maybe that's something we should explore further. After five years, at $20,000, The Story Prize still offers the highest amount of any annual U.S. book award for fiction. Among the major fiction prizes, PEN/Faulkner pays $15,000, and the National Book Awards and the Pulitzer Prize both hand out $10,000. Of course, U.S. book awards offer the promise of reaching a larger audience. The Pulitzer, in particular, can pay rich dividends. Elizabeth Strout's Olive Kitteridge remains on the paperback bestseller list after 15 weeks. The U.S. also offers other support to writers, such as the MacArthur genius grants. Still, wouldn't it be nice to see some larger literary prize sums in the offing? 11:00 a.m. Short Stories Stand Tall. A panel discussion exploring the advantages, tools, and inspiration authors gain by writing shorter fiction. Featuring Jeffery Renard Allen (Holding Pattern), Joan Silber (Ideas of Heaven: A Ring of Stories) and A.M. Homes (Things You Should Know). Moderated by Larry Dark, director, The Story Prize. In addition, the festival is honoring first-ever winner of The Story Prize Edwidge Danticat with the Brooklyn Book Festival Best of Brooklyn, Inc. (BoBi) Award. Danticat grew up in Brooklyn after leaving Haiti as a child. My connection to Brooklyn is that I've been there several times. I didn't come up with the theme for the panel, but I think it's a good one—the short story is standing tall—and I'm looking forward to sharing the stage with Jeffrey, Joan, and A.M. If you would like to suggest any questions, you can send them to me at ldark@thestoryprize.org.